Primary Target: Boys and girls aged 3 to 12 years, with a skew towards boys. Due to the brand heritage and longevity of the character Sonic is well known by both kids and parents. These are the official Sonic the Hedgehog™, Amy & Tails licensed characters, Sonic the Hedgehog™, Amy & Tails. 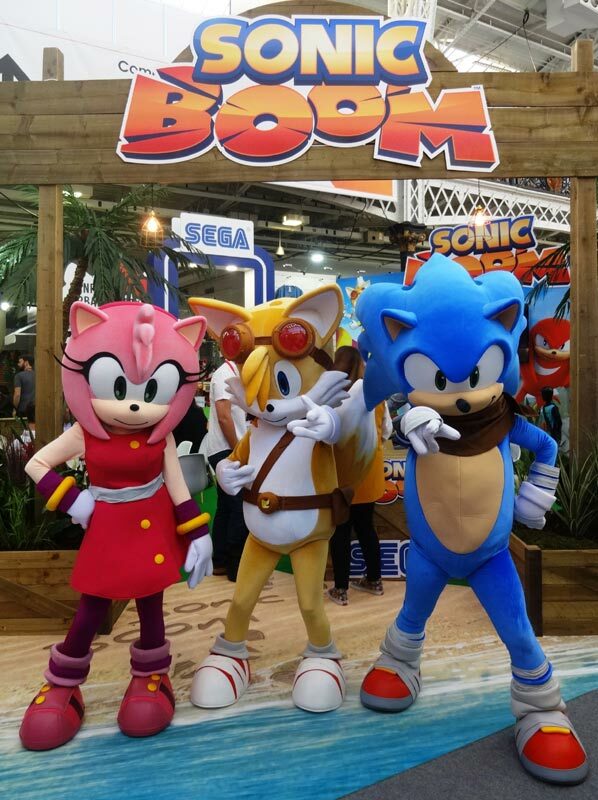 Rainbow Productions holds the UK’s official licence to manage the personal appearances of Sonic, Amy and Tails at public events on behalf of the brand owner. Sonic is known for moving at superfast speeds always looking for adventure. He lives by his own rules, but he keeps his promises and helps his friends out when in danger from evil foe Dr Eggman. Sonic always saves the day! Although Amy is sweet and pink, there is more to her than meets the eye. She is skilful and talented in combat and tends to take charge. She is also an expert on the legends of the world and makes great cookies! Sonic’s best friend is Tails. He is a keen inventor and creates gadgets to give his team the edge and to make life easier, although the latter can sometimes be debatable. He is a planner and tactical, when it comes to taking on a challenge. Now, Sonic races onto our TV screens in his first CG TV animation, Sonic Boom™. The TV show is currently airing in the UK on Boomerang, weekdays at 4pm. Sonic Boom™ is action packed featuring robot battles, team work, friendship and comedy. Sonic has appeared in more than 70 games to date. Over 350 million video games sold or downloaded across console, PC and mobile platforms worldwide since the first game appeared in 1991. Sonic has enjoyed huge success in a wide number of additional areas including comics, apparel and toys, to starring in 5 animated TV series to date. TV series Sonic Boom is airing in over 100 countries worldwide. Series 2 launched in 2017. A new hybrid CG-animated/live action family film is being developed with Sony Pictures. Mascot costume Sonic is available to attend UK events.